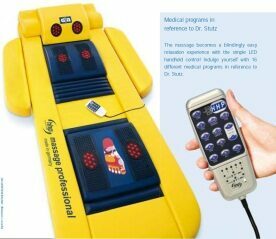 Successfully used by Germany's leading physiotherapists, medical practioners and clinics. The Andullation massage with infrared deep heat generates a stimulation, which expands the blood vessels and results in better blood circulation in the respective tissue. The effect is a very pleasant heat sensation. Different zones of the skin are connected to internal organs through nerve reflexes. Therefore, Andullation does not only stimulate the skin and muscles, but also the interaction of the internal organs. This is a main prerequisite for maintaining your health. Back pain is among the most predominant endemic diseases, and that is no coincidence. Job-related sitting, standing, bending down and lifting motions, which always follow the same and most often wrong patterns, stress the spine day in and day out. Careful diagnostic analyses reveal that 89% of all back pain can actually be attributed to such biomechanical stress. This leads to muscle tension, myogelosis and circulatory disorders, which result in even more pain. The increasing tendency is alarming. This idea was the basis for the development of an Andullation Massage System with eleven motors and thermal infrared deep heat, working just like a small massage praxis in your home. You can also have your own massage therapist at home!